Every time Auburn tried to get closer, however, the Blue Devils answered with an alley-oop dunk or step-back jumper. Duke will play No. 3 Gonzaga on Wednesday night, seeking an unprecedented sixth Maui Invitational title. Marques Bolden anchored Duke’s defense, blocking seven shots while finishing with 11 points and nine rebounds. The Blue Devils blocked 11 shots overall. Jared Harper had 22 points and Bryce Brown 16 for Auburn. LAHAINA, Hawaii (AP) — Rui Hachimura scored 24 points, Zach Norvell Jr. added 20 and Gonzaga earned a spot in the Maui Invitational title game with a win over Arizona. Two-time Maui champion Arizona (4-1) fought back to keep it close, but only for a little while. Gonzaga went on another run, pushing the lead 79-67, and kept the Wildcats at bay from there. Justin Coleman had 28 points for Arizona, which had three assists on 21 field goals. 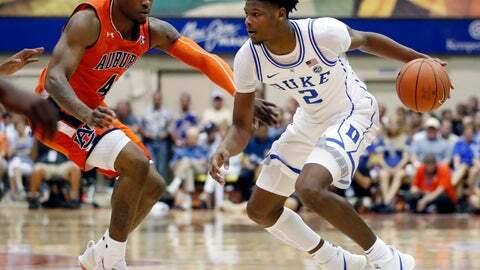 GEORGE TOWN, Cayman Islands (AP) — Marcquise Reed scored 24 points and grabbed nine rebounds, Elijah Thomas had his second straight double-double and Clemson beat Georgia to reach the championship game of the Cayman Islands Classic. The Tigers will play Creighton for the title Wednesday. Thomas finished with 12 points and 11 rebounds for Clemson (5-0), off to its best start since the 2013-14 season. Shelton Mitchell, who scored a season-high 22 on Monday, chipped in with 13 points and David Skara had three of the Tigers’ nine steals. Coach Brad Brownell won his 154th game at Clemson, three from passing Bill Foster for second in program history. Derek Ogbeide led Georgia (3-2) with 11 points. FORT WORTH, Texas (AP) — Garrison Mathews had 23 points, Kenny Cooper scored 17 with a couple of breakaway layups off steals and Lipscomb held on to upset TCU for its first win over a Top 25 team. Lipscomb (4-1), the ASUN Conference preseason favorite, had been 0-13 against ranked teams since 2006. All those losses were by double digits. Alex Robinson had 17 points, 10 rebounds and six assists for TCU (3-1), which lost a November game for the first time since 2015. The Horned Frogs‘ 18-game winning streak during the month had been the second-longest among Division I programs, behind only Virginia’s 21 in a row. The Bisons built a 12-point lead before Mathews rebounded a missed 3-pointer by Kouat Noi that would have tied the game with just more than a minute left. Mathews then made a 3 at the other end. EUGENE, Ore. (AP) — Bol Bol had 21 points and nine rebounds, Payton Pritchard added 18 points and Oregon held off Green Bay. Sandy Cohen III led the Phoenix with 18 points. COLUMBUS, Ohio (AP) — Kaleb Wesson scored 17 points, Keyshawn Woods added 14 and Ohio State shook off a sluggish first half to beat scrappy Samford. Ohio State (5-0) seemed out of sync from the opening tip, as coach Chris Holtmann benched four starters for being late to “game-day preparation,” according to the school. The Buckeyes shot just 37.5 percent from the field in the first half while Samford shot 50 percent and led 32-29 at the break. But in the second half, Ohio State went on a 21-3 run that sealed the win. The Buckeyes shot 50 percent to 24 percent for Samford (5-1). Junior guard Myron Gordon led the Bulldogs with 18 points.